We’d love your help. Let us know what’s wrong with this preview of The Immortality Protocol, Vol 1 - light novel by Robert E. Parkin. In a world laid bare, humanity scattered, one girl fights to reclaim what was stolen from her—the only family she has left. Her name is Tepes. Pushed by this one goal, Tepes stumbles upon one of humanities last bastions within its ruined world—Sky Cities. Here, she quickly is sucked into a world ruled by a masked mad man obsessed with order. She soon finds herself trapped In a world laid bare, humanity scattered, one girl fights to reclaim what was stolen from her—the only family she has left. Her name is Tepes. Pushed by this one goal, Tepes stumbles upon one of humanities last bastions within its ruined world—Sky Cities. Here, she quickly is sucked into a world ruled by a masked mad man obsessed with order. She soon finds herself trapped in the middle of a desperate fight between a small rebel faction and the cornerstone of the city itself, the Eye of the Adjudicator. It is in this struggle she will come to see that there is far more going on within this Sky City then she would care to believe. No one can escape, from the Eye of the Adjudicator. 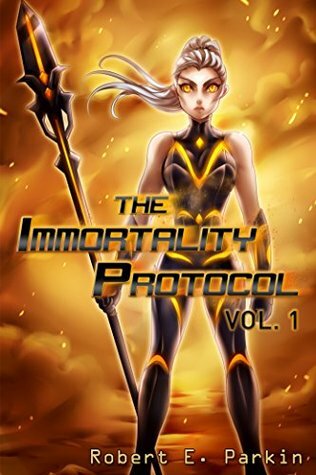 To ask other readers questions about The Immortality Protocol, Vol 1 - light novel, please sign up.